Read the Geodesign Workshop Final Report here. Sustainable Urban Development (SUD) decisions are complex. Urban landscapes are characterised by interrelated social, environmental, economic and infrastructural subsystems that change over time. And so collaborative frameworks like Geodesign are necessary to support SUD decision-making, which requires the alignment of diverse interests held by stakeholders from each subsystem, and due consideration for information uncertainty about how these systems function and evolve. 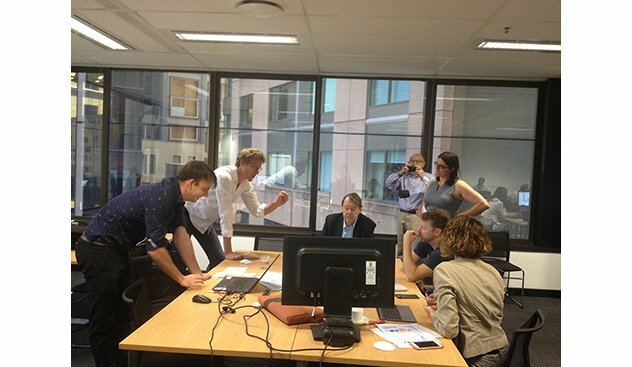 CFRC organised the first Geodesign workshop to be held in Australia. Representatives across state and local government, infrastructure agencies, industry, and academia were brought together to collaborate on a strategic plan for Sydney’s South East Catchment 2050. Forty representatives from local government, state agencies, industry and academia were invited to participate in an intensive two-day workshop. The participants were divided into six teams representing stakeholder groups with different strategic aspirations for the study area. The workshop objective was for the teams to produce a consensus design for the study area at the end of the second day. Using a browser-based mapping platform, participants drew the location and extent of specific development projects that would be part of their group’s vision of the study area. Participants also assigned costs and timeframes to each project they proposed. The teams then entered into negotiation rounds to deliberate on which projects should be included. Team representatives explained their group’s interests in each project, and considered the project timing and costs in their decision. With the negotiation process facilitated by the mapping platform, the teams were able to quickly identify specific areas where they share common goals with other groups, and where there were conflicting interests. In a short amount of time, the team discussions revealed opportunities for collaboration as well as needs for compromise. From over 400 different project proposals and versions, the participants were able to agree on the projects that would be included in their consensus design. Project timelines were also adjusted to ensure that their funding and implementation schedules were coordinated. Survey feedback revealed that while some participants felt that the final consensus design diverged greatly from their team’s vision for the study area, that they understood the series of decisions and agreements that led to the consensus design.